TSPSC TRT Online Certificates verification Schedule for Bio Data Verification with Originals 2018. 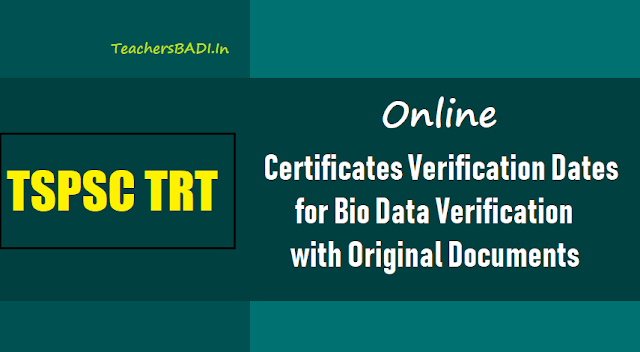 TSPSC TRT SA, SGT Online Certificates verification dates to verify Candidates Bio Data Verification with Originals 2018. Dates for online Certificates Verification to conduct camps at erstwhile 10 District Headquarters. Telangana Public Service Commission, Hyderabad have decided to conduct online certificate verification to verify candidate's Bio-data particulars with originals at (10) erstwhile District Headquarters of Telangana state by entrusting to District Educational Officer (DEOs) of the erstwhile Revenue Districts of the state of Telangana State.